Riot police form a line as protesters move in front of them. Photo by Justin Giovannetti. The cop is standing in my way and it’s pretty clear that I’m not getting around him without his say-so. I open my bag, showing him the contents—one clean t-shirt, one pair of gym shorts, four CDs, one pair of running shoes, one notepad and one pen. He nods at me and allows me to go on my way. He stops the girl behind me to read what her sign says, before waving her on. The cops are on alert, but they’re also taking no chances at doing anything that can be misconstrued as beyond their powers. I’m stopped again about ten feet later and after quickly explaining that I’ve already been searched, I sigh and open my bag again. The crowd is gathered outside Police headquarters on College Street, between the busy intersections of Bay Street and Yonge Street. Hundreds of police officers watch impassively, showing little reaction to the constant cries of “Shame!” hurled at them. The people smoke cigarettes, talk with friends, stir up occasional protest chants, listen to the drum circle that has formed and wait for the rally to begin. One guy towards the back lights up a joint, but quickly stubs it out when people around him openly question his sanity. 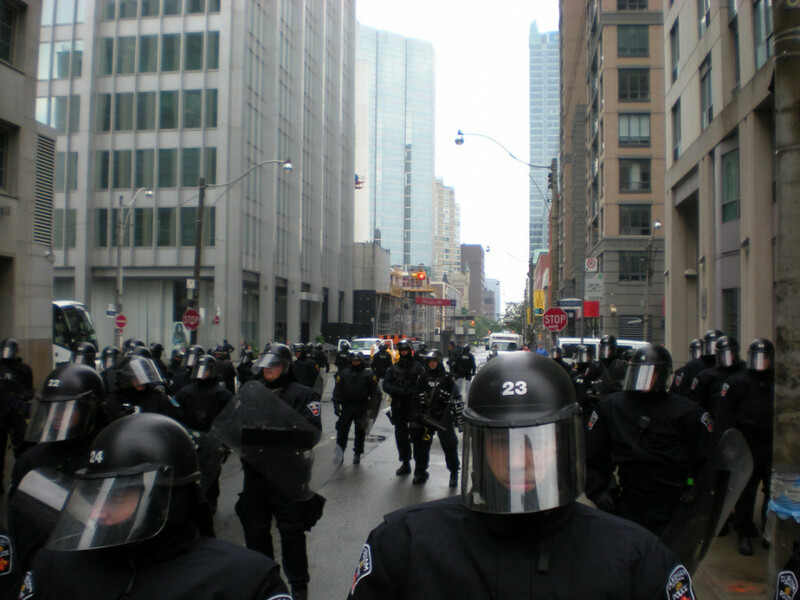 After what these activists have seen during the G8 and G20, there is no such thing as paranoia where cops are involved. The sound system is not working properly. The speakers struggle to be heard. Ben Powless, a Mohawk photographer shouts through a bullhorn. “Action must be taken! Human rights violations must be investigated!” He promises a collective lawsuit against the police. The crowd roars its approval. “I’m pissed off at what has gone on in the building behind us. Stop playing PR games with our friends and let them out of jail.” Naomi Klein is speaking, and the throng is loving her. This is the kind of crowd that has read No Logo more than once. The sound system craps out again, and soon we’re moving. The police move with us, receiving more taunts. They remain impassive, but the people are angry. They know what happened and they want answers. Organizer David McNally is a professor of political science at York University and a well known activist. He’d like to know why Toronto Police were trained to recognize protesters as foes, regardless of whether their activities were non-violent or not. Jennifer Stewart wants to know what crime she was planning to commit when she was busted on a conspiracy charge on Saturday night. Unfortunately, her story is not an isolated case. But even those who were not detained want answers. Katryn Prerin is a lawyer, marching because she saw a dangerous precedent being set during the G20 protests. During the course of the four hour march, many different views and political statements were heard by the crowd. They ranged the gamut from the fringe-left’s cries for the abolition of the G20 and G8 and demanding the imprisonment of Prime Minister Stephen Harper, to Mohawk activist Ben Powless’ pleas to Premier Dalton McGuinty to establish an independent inquiry regarding charges of police brutality over the weekend. The one unifying message was that in Canada, nobody is above the law, least of all those who are charged with enforcing it. The cops watched impassively, for the most part. They showed no reaction to the four hours of criticism thrown their way. Some of them joked with the occasional marcher. Some even posed for pictures with the curious passer-bys. Some of them may think they were within their rights to arrest, beat and humiliate whoever they wished, due process be damned. I’d like to think most of them were thinking what one police officer let slip within earshot of me, quickly telling me to forget what I’d heard. In a few days, it will be Canada Day, a national holiday for us to celebrate what Canada was, what it is and what it can become. It will be hard for those marching to be too joyous, because they know what Canada can be, unless its citizens are vigilant. Our national anthem proclaims “We Stand on Guard for Thee.” As Canada celebrates another birthday, it has never been more important to realize that those words are not just about defending borders, but the ideals contained within them. Hopefully, a few of the security forces, and those commanding them, will take a moment to reflect as well.